SINGAPORE--(Marketwired - Mar 29, 2016) - Earlier this month at the LAUNCH Festival 2016 in San Francisco, IBM announced that gridComm has been selected as a SmartCamp top three finalist. Based in Singapore, gridComm provides connectivity solutions IoT (Internet of Things) systems and devices based on hybrid power line communications and RF technology that makes use of existing power line networks. This enables the transformation of the electricity grid into a smart grid, connecting street lights, power meters, sensor networks and industrial equipment. "Being selected as one of the top three finalists at the IBM Smart Camp is truly an honor," said Mike Holt, CEO of gridComm. "This is further validation of both our technology and the opportunity that exists to help cities all over the globe save millions of dollars in electricity costs by enabling city-wide sensor connectivity. IBM's SmartCamp has helped ramp up commercialization plans for gridComm's smart grid products. We're utilizing IBM for data analytics to automatically determine street light dimming levels and enable predictive maintenance." The IBM Global Entrepreneur SmartCamp is a one part mentoring bootcamp, one part networking extravaganza, and one part epic pitch competition between rising startups from around the globe. Aimed at identifying early stage entrepreneurs, the IBM SmartCamp provides an avenue for startups to take advantage of mentoring opportunities, learn from thought leaders, and network with serial entrepreneurs, investment firms, academic institutions, and industry and technology experts. For more information, visit http://www.smartcamp2015.com/. gridComm provides power line communications semiconductors, devices and systems that enable the transformation of the electricity grid into a smart grid. By connecting utilities to their customers, gridComm's semiconductors, modules and DIN Rail PLC modems help to transform meters, streetlights, homes and industrial buildings and other appliances into energy-aware "smart devices" that react to conditions on the grid, thus implementing a worldwide communications network or Internet of Things (IoT) based on the existing power grid. gridComm is headquartered in Singapore. 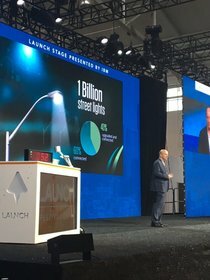 Onstage at the IBM LAUNCH Festival: gridComm's Mike Holt explains how the company's technology monitors and controls street lights and smart meters over the power grid. In this presentation from IBM's LAUNCH Festival, gridComm's CEO Mike Holt explains how the M2M company uses existing power line networks to make smart cities smarter.